Many business owners are jumping on the bandwagon to sell their companies, trying to take advantage of the current hot market and frothy multiples being paid by buyers. With the impending Baby Boomer tsunami, more businesses are and will be for sale over the next few years than at any other point in history. This trend creates a competitive environment among sellers and leads buyers to look more closely at the quality and price value relationship of any potential acquisition. For some time now, due to strong earnings, low interest rates and favorable capital markets, many buyers have sought to grow their businesses more rapidly through acquisitions vs. organic growth. Therefore, one would think that sellers would have a field day in selling their businesses. Some sources estimate that 80% of small and middle market business owners who put their businesses up for sale never close the transaction. 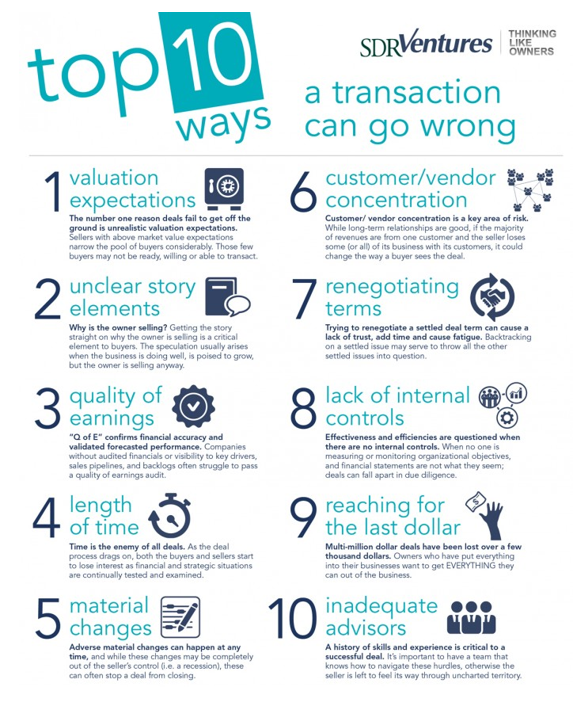 From years of observation, I have found that most deals fall apart (i.e., fail to close) for 10 basic reasons. The number one reason deals fail to close is because a seller’s valuation expectations are too high. Many business owners read and hear about companies or competitors operating in their same space selling for very high valuations. Therefore, they believe that their businesses are worth the same. Business owners need to think like buyers. Attracting a buyer is like preparing for a beauty contest. Companies that “show best” win first place. Often, because of poor strategic planning, the business owner cannot articulate clearly the company’s competitive advantages, its growth opportunities, its revenue potential, and its ability to produce significant returns on invested capital. Further, business owners often fail to communicate the strength of their management team and their entrepreneurial desire to continue growth and expand the business post transaction. Audited financial statements confirm financial accuracy and help validate forecasted performance. Lack of clarity and visibility regarding key business drivers, sales pipeline backlogs, back office operations, and the consistency of growth and earnings inhibit a buyer’s enthusiasm to continue its due diligence. Every deal has a life of its own and its own momentum. Recognizing the ebb and flow of the deal momentum is critical to deal success. Time is the enemy of all deals. As the deal process drags on, both buyers and sellers start to lose interest. Substandard or unduly drawn out due diligence analysis of financial and strategic matters is the worst culprit. If the buyer does not have a strong due diligence team, or if the seller is not prepared well for the buyer’s due diligence process, deal momentum is lost. Material changes in the business’s operations can occur at any time. While these changes may be completely out of the seller’s control (e.g., recession, loss of a large client, loss of a key employee), often these changes can stop a deal from closing. If a material change does occur, the seller should disclose it promptly and fully to the potential buyer. Nothing will destroy a buyer’s trust quicker than the seller failing to be up front about a material change in the business. If a significant amount of revenues is concentrated in a few customers, or if critical supply chain raw materials are concentrated in one vendor, the buyer’s perception of risk is elevated substantially. Regardless of the longstanding business relationship that the seller may have with any customer or vendor, buyers have to factor in the potential loss of that customer or supplier. Ultimately, mapping out the consequences of that loss could cause the buyer to walk away from the deal. Renegotiating the terms, conditions, structure, and representations and warranties of a settled deal can be a deal killer. At the very least, back-tracking deal components that have been previously agreed upon kills deal momentum, adds time, and causes deal fatigue.” It also fosters distrust and can call into question all other components of the deal structure previously negotiated. Frequently, the buyer’s due diligence process will reveal sloppiness (or worse) in internal controls (e.g., weak collection processes for aged receivables, manufacturing error rates, aberrations in the financial statements, regulatory filing inconsistencies). A buyer may become concerned that the business is not well run. Effectiveness and operating efficiencies come into question when there is a lack of effective internal controls. Once the buyer becomes concerned about the seller’s internal controls, the deal can go south in a hurry. It is completely understandable that sellers who have put everything into their business want to get every dollar they can out of their business. Often, owners trap themselves mentally by fixating on a specific price for the company. Many owners will decide to pass on a deal, believing that the next potential buyer will pay more than the current potential buyer. Multi-million dollar deals have been lost over a few thousand dollars. I recommend to our clients that they should examine all components of the deal’s structure — not just the final offering price. If the particular deal meets their exit plan goals, my counsel is not to get hung up on price components alone. Selecting a quality deal team is critical to deal success. In my experience, business owners are very good at building successful businesses, but often stumble when seeking to monetize them in some form of exit. Selling a business is a once-in-a-lifetime event for most business owners. Most owners have never sold a business and do not have the skills to complete a deal on their own. Research indicates that owners who go it alone, more often than not, will leave money on the table and fail to obtain the best terms and conditions for the transaction. I believe a successful deal team has five key members: (1) an experienced M&A consultant to lead the transaction team; (2) a skilled wealth management firm to help owners maximize proceeds and to minimize tax obligations from the sale of the company; (3) a transaction law firm (which may or may not be the owner’s regular corporate law firm) that has significant transaction experience and expertise; (4) a transaction accounting firm familiar with the tax implications of various deal structures and who can work collaboratively with the owner’s wealth management firm; and, (5) a strong investment banking firm with deep industry experience in the space, solid valuation expertise, and keen negotiating and closing transaction skill sets.